If Christianity is moving North to South, as we often hear these days, then what about the East? By emphasizing this "North to South" typology are we—yet again—ignoring the East? Sure, we understand Christianity in the southern hemisphere is booming, but what about Christianity in the Middle East, in Central Asia, and in that vast swath of territory we call "Eastern Europe"? The Middle East, Northeast Africa, and former Persia were real heartlands of Christianity during the first millennium, and Eastern Europe, particularly Russia, rivaled the West as the world's most Christianized civilization until the 20th century. Yet it is altogether common for Western scholars to take an entire degree in Christian history or theology, only to come to the stark realization that the history of the faith in the East was scarcely mentioned, particularly after the Great Schism of 1054. In recent years we have seen some very helpful correctives to this lacuna in our scholarship. 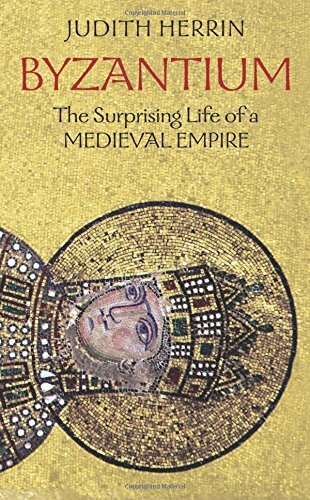 One of the best is Judith Herrin's Byzantium: The Surprising Life of a Medieval Empire. The inspiration for this volume came one day in 2002 with a knock on Herrin's office door at King's College, London. She was greeted by two "serious builders in hard hats and heavy boots." The men were doing repairs when caught by the intriguing title on her door, "Professor of Byzantine History." Herrin was asked to summarize 1,123 years of history—from the dedication of Constantinople in 330 to its fall in 1453—in ten minutes. Impossible. But it did force her to think about how to boil it all down, and in this book she has done a very fine job. "Byzantine" is an intimidating word. What exactly do we mean by it? In the West, the word has evolved to mean something unnecessarily complicated or devious. This distortion is likely a relic of longstanding hostilities between East and West. Herrin writes: "The modern stereotype of Byzantium is tyrannical government by effeminate, cowardly men and corrupt eunuchs, obsessed with hollow rituals and endless, complex and incomprehensible bureaucracy." Instead, she wants us to imagine a magnificently sophisticated civilization, studded with intelligence, order, and metropolitan vibrancy. And she justifies her preference by taking a "people's history" approach to the topic. Instead of the typical "Great Men" approach to empires—narrowing the foci to emperors, bishops, and prime movers—she bathes her narrative in the ordinary and earthy without sacrificing the aristocratic. The hoi polloi surface time and again in her social descriptions: builders, children, wives, and soldiers, all tending to their daily tasks. Herrin's discussions of Byzantine education are particularly illuminating. She tells of children learning Aesop's Fables and progressing into their studies of rhetoric and persuasion in the teen years. More advanced students took on the quadrivium—arithmetic, geometry, harmonics, and astronomy. Only the most élite intellects were privileged to enter the discourses of Plato and Aristotle. Byzantines were a literate people; perhaps no other attribute is as evident in her story. Parents wrote to teachers with concerns about their kids' grades. Letters have been preserved on virtually every topic of the day, "diet, climate, friendship … expressions of sympathy … congratulations on marriage and the birth of children." Transporting the reader back to a proud and golden time, Herrin's narrative vivifies a shadowy era, most poignantly when she leads us through the streets of the magnificent capital. If Constantinople was the heart of the empire, then the Hagia Sophia was the soul. Herrin's description of that breathtaking masterpiece, that wonder of the Byzantine world, is unforgettable: lamps solemnly burning round the clock, casting a copper glow on massive, larger than life icons that bring people to their knees in reverence. Marble flooring, gold-painted gallery ceilings, silver disks, precious stones, linens, and colors from the farthest reaches of the Roman Empire, all led Emperor Justinian I to proclaim his satisfaction "Solomon, I have surpassed thee." Visitors from other civilizations agreed: when Russian envoys entered this largest church in all of Christendom in 988, they later recounted, they "knew not whether we were in heaven or on earth … . We cannot describe it to you: only this we know, that God dwells there." Constantinople was the jewel of the world for Byzantines, and they fought many battles over the course of centuries to protect their treasure. The walls of Constantinople were so impenetrably built that the city survived far longer than it should have. And the naturally protective location of the city was strategically brilliant. Any threat from the sea was met by Greek Fire—that mysterious substance shot out of tubes at invading boats—discouraging restless Muslim navies eager to make Constantinople their own capital.